Aquí encontrarás los resultados más relevantes. The pine processionary moth (Thaumetopoea pityocampa Dennis and Schiff. ), one of the major defoliating insects in Mediterranean forests, has become an increasing threat to the forest health of the region over the past two decades. After a recent outbreak of T. pityocampa in Catalonia, Spain, we attempted to estimate the damage severity by capturing the maximum defoliation period over winter between pre-outbreak and post-outbreak images. The difference in vegetation index (dVI) derived from Landsat 8 was used as the change detection indicator and was further calibrated with Unmanned Aerial Vehicle (UAV) imagery. Regression models between predicted dVIs and observed defoliation degrees by UAV were compared among five selected dVIs for the coefficient of determination. Our results found the highest R-squared value (0.815) using Moisture Stress Index (MSI), with an overall accuracy of 72%, as a promising approach for estimating the severity of defoliation in affected areas where ground-truth data is limited. We concluded with the high potential of using UAVs as an alternative method to obtain ground-truth data for cost-effectively monitoring forest health. In future studies, combining UAV images with satellite data may be considered to validate model predictions of the forest condition for developing ecosystem service tools. Science and society are increasingly interested in predicting the effects of global change and socio-economic development on natural systems, to ensure maintenance of both ecosystems and human well-being. 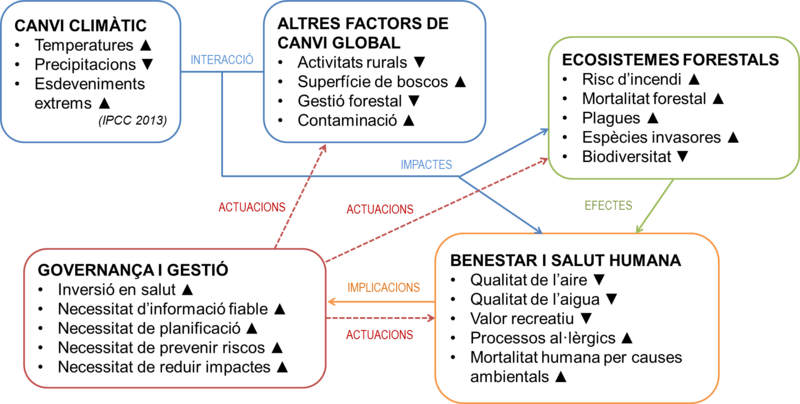 The Intergovernmental Platform on Biodiversity and Ecosystem Services has identified the combination of ecological modelling and scenario forecasting as key to improving our understanding of those effects, by evaluating the relationships and feedbacks between direct and indirect drivers of change, biodiversity, and ecosystem services. Using as case study the forests of the Mediterranean basin (complex socio-ecological systems of high social and conservation value), we reviewed the literature to assess (1) what are the modelling approaches most commonly used to predict the condition and trends of biodiversity and ecosystem services under future scenarios of global change, (2) what are the drivers of change considered in future scenarios and at what scales, and (3) what are the nature and ecosystem service indicators most commonly evaluated. Our review shows that forecasting studies make relatively little use of modelling approaches accounting for actual ecological processes and feedbacks between different socio-ecological sectors; predictions are generally made on the basis of a single (mainly climate) or a few drivers of change. In general, there is a bias in the set of nature and ecosystem service indicators assessed. In particular, cultural services and human well-being are greatly underrepresented in the literature. We argue that these shortfalls hamper our capacity to make the best use of predictive tools to inform decision-making in the context of global change. Scientific poster. Vienna, 8-13 April 2018. European Geosciences Union General Assembly. Pine processionary moth (PPM) is one of the most destructive insect defoliators in the Mediterranean for many conifers, causing losses of growth, vitality and eventually the death of trees during outbreaks. There is a growing need for cost-effective monitoring of the temporal and spatial impacts of PPM in forest ecology to better assess outbreak spread patterns and provide guidance on the development of measures targeting the negative impacts of the species on forests, industry and human health. Remote sensing technology mounted on unmanned aerial systems (UASs) with high-resolution image processing has been proposed to assess insect outbreak impacts at local and forest stand levels. Here, we used UAS-acquired RGB imagery in two pine sites to quantify defoliation at the tree-level and to verify the accuracy of the estimates. Our results allowed the identification of healthy, infested and completely defoliated trees and suggested that pine defoliation estimates using UASs are robust and allow high-accuracy (79%) field-based infestation indexes to be derived that are comparable to those used by forest technicians. When compared to current field-based methods, our approach provides PPM impact assessments with an efficient data acquisition method in terms of time and staff, allowing the quantitative estimation of defoliation at tree-level scale. Furthermore, our method could be expanded to a number of situations and scaled up in combination with satellite remote sensing imagery or citizen science approaches. 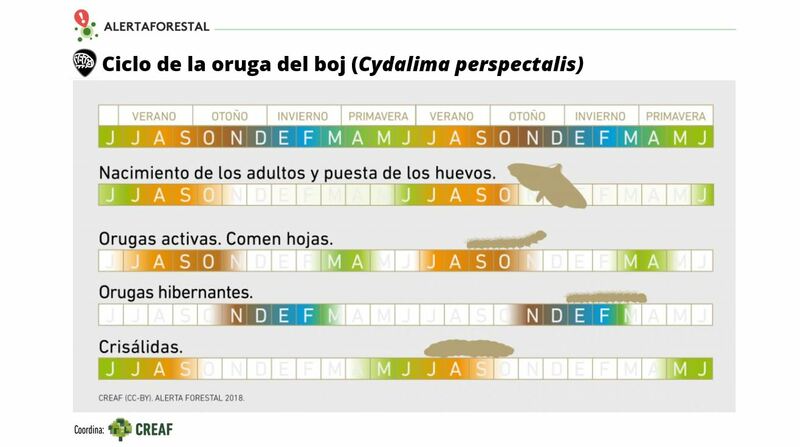 Estadios que va desarrollando al largo de su vida (y del año) la oruga del boj (Cydalima perspectalis), des de que sale del huevo hasta que se convierte en mariposa. 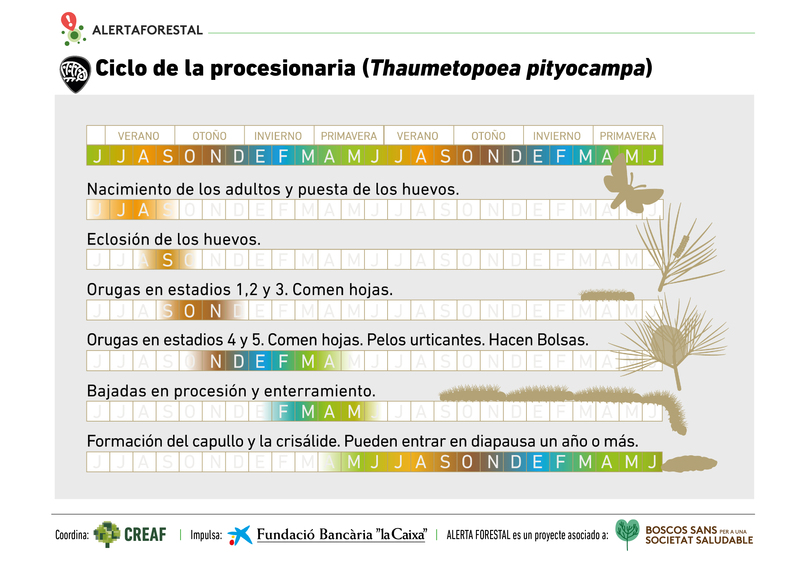 Estadios que va desarrollando al largo de su vida (y del año) la procesionaria del pino (Thaumetopoea pityocampa), des de que sale del huevo hasta que se convierte en mariposa. ¿Cuáles son las relaciones que establecemos en el proyecto Bosques Sanos para una Sociedad Saludable? En este esquema se dibujan las actuaciones e implicaciones entre la gestión (y governanza) de los bosques, el bienestar y la salud humana y los factores de cambio global que hemos de tener en cuenta. Los árboles responden de manera similar, pero no idéntica, a los episodios de sequía. Las coníferas pueden mostrar los efectos con retraso, cuando la sequía ya ha pasado. Las frondosas mediterráneas, en cambio, suelen mostrarlos pronto, pero a menudo son capaces de rebrotar: si el árbol está vivo, suelen brotar hojas nuevas de la copa; si sólo las raíces siguen vivas, pueden brotar nuevos tallos de la base del tronco.